Low Carb Diet News - Tag Archive for "Butter"
7+ Fruit & Veg a Day? On a Low Carb Diet!? Added Sugar is The Single Worst Ingredient in The Diet. Period. Does it Really Cost More to Eat Healthy? How much sugar is in your 'healthy' brown and wholemeal bread? Success Story: "Low Carb - It's Amazing How Easy It Is"
…New statistics from The Swedish National Board of Health and Welfare show the exact opposite. The incidence of heart attacks in Sweden keeps plummeting, for both men and women, just as they have done since 2005. We are becoming healthier, despite eating more and more butter. As modern science time and time again has shown that a low-fat diet doesn’t do anything good for heart health, nobody should be surprised. But there are definitely people that need to update their knowledge. Above is the butter consumption in Sweden (yellow line) in relation to statistics on heart disease (blue + purple). The axis for butter consumption is to the right. The Swedish butter consumption just keeps going up, while the incidence of heart attacks keeps going down. Many of us will know the gustatory gratification butter can give us, whether spread on a piece of bread or toast, infused in mashed potato or melted over some veggies. However, we also likely to be only too aware of butter’s rich stash of saturated fat, which we’re warned raises our risk of heart disease via an elevating effect on cholesterol. Butter has inevitably been damned tonutritional hell by official health bodies, which have eagerly advised us to opt for lower-fat and cholesterol-reducing spreads instead. This week, though, a British Medical Journal article by cardiologist Dr Aseem Malhotra which urges us to choose butter every time hit the headlines. So, are our beliefs about the ‘heart-healthy’ properties of margarine built on solid scientific foundations, or just the result of slick marketing and misinformation? Is it time we got our fats straight? The original health claims for margarine centred on its lower saturated fat content compared to butter. But, seeing as the evidence essentially exonerates saturated fat, this claim has no legs. Recent years have seen the emergence of cholesterol-reducing spreads into the market. It’s often assumed that cholesterol reduction is beneficial to heart health. However, several cholesterol-modifying drugs have not been found to deliver on their promise, and some have been found to actually harm heart health. Plus, overall, taking dietary steps to reduce cholesterol has not been found to have broad benefits for health. 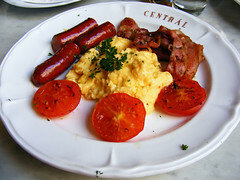 Again, the effect that a foodstuff has on cholesterol levels should not be our focus, but the impact it has on health. What evidence do we have that cholesterol-reducing margarines reduce the risk of heart disease, heart attack or overall risk of death? Not one single study of this nature exists in the scientific literature. Some cholesterol-reducing margarines contain ‘plant sterols’ that partially block absorption of cholesterol from the gut. However, sterols may make their way into the bloodstream too, and evidence links higher levels of sterols in the blood with increased risk of cardiovascular disease. Perhaps worse still, there are several studies that show sterols have the ability to damage tissue and induce worse health outcomes in animals. While the British Heart Foundation and many doctors heartily support the use of sterols, the National Institute of Health and Care Excellence (NICE) explicitly advises against their routine use. In the final analysis, I find it impossible to reconcile margarine’s heart-healthy image with the facts. The fat-phobia that drove our broad switch from butter to margarine in recent decades never did have any meaningful scientific support, and I believe has been a huge retrograde step in terms of our health. I am a practising doctor and the author of several books on nutrition, and in over 20 years I have not bought a single tub of margarine, nor have consciously limited butter in my diet. There’s little doubt in my mind that butter is better, and not just in terms of how it tastes. To my mind, butter need not be a guilty pleasure at all, but just a pleasure. Is the LCHF Diet a Threat to Public Health? It all started with an opinion piece by a few senior fat-fearing professors, in Sweden’s biggest newspaper, called “The popular fat diets are a threat to public health” (link to Google translation). This exploded into massive headlines in every paper and became the main piece of news on TV (I was on a morning show briefly to discuss it). The most bizarre thing is that the opinion piece suggests that there’s been an increase in risk of heart disease & stroke in Sweden – and they blame the popularity of LCHF. However, the risk of heart disease and stroke in Sweden is on the contrary going down, faster and faster, according to the latest statistics. It’s absolutely bizarre how little evidence is needed to trash low-carb diets. What the professors were referring to was a subgroup of people: young women with a very short education. The risk of heart disease for this group has indeed increased – since 1995! In other words, the increase in butter sales in the 2010s are being blamed for an increase in heart disease risk in the 1990s! I know there are some misconceptions about the dangers of butter, but really, do they now believe that butter can travel through time? More (including charts) at: Is the LCHF Diet a Threat to Public Health? Articles are presented in good faith but we cannot be held responsible for any content - the opinions presented are for educational and illustrative purposes only and should not be considered as either individual advice or as a substitute for medical and other professional services intended to suit your specific personal needs. Always consult a competent medical professional for answers specific to your questions and circumstances.